Anna Jones is a cook, food writer and stylist. One grey, late-for-the-office day, she decided to quit her day job after reading an article about following your passion. Within weeks, she was signed up on Jamie Oliver’s Fifteen apprentice programme. She went on to be part of Jamie’s food team – styling, writing and working behind the scenes on books, TV shows and food campaigns. 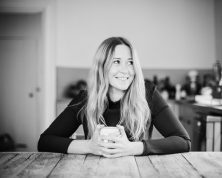 Now freelance, she has worked with some of the country’s biggest food brands, including innocent drinks for whom she wrote the recipes for Hungry? : the innocent recipe book for filling your family with good stuff. She has also worked with other well-known chefs, such as Henry and Tom Herbert (The Fabulous Baker Brothers), Stevie Parle and Antonio Carluccio, and cooked for royalty, politicians and LA school children alike. A Modern Way to Eat is her first solo book. She lives, writes and cooks in Hackney, East London.